Major Archbishop Sviatoslav Shevchuk has led the Ukrainian Greek Catholic Church since 2011. In the Autumn 2016 edition of ONE, writer Mark Raczkiewycz profiles Major Archbishop Sviatoslav Shevchuk, leader of the Ukrainian Greek Catholic Church — and below, offers some additional reflections on their conversation. After spending a little over 30 minutes interviewing his beatitude, Major Archbishop Sviatoslav Shevchuk — head of the Ukrainian Greek Catholic Church — I was reminded of the strong historic continuity which clergymen bring to spiritual service. Immediately acknowledging that the church’s roots stem from Constantinople, more than a half century before the Great Schism of 1054, Archbishop Sviatoslav carefully chose his words throughout the interview, as if to reinforce the institutional memory that his position embodies. He didn’t convey his main points in a philosophical or lofty manner. Archbishop Sviatoslav spoke with an upbeat and excited tone, a sign that he is at ease with his role of serving more than eight million faithful worldwide. That assuredness keeps him grounded. Along the way he got a doctorate in moral theology in Rome. He also learned to speak seven languages — our interview was in English, although I am fluent in Ukrainian — and, according to priests in Chicago, where Archbishop Sviatoslav visited earlier this year, the major archbishop is an avid violin player and even sings as a cantor when needed. Although the majority of the faithful live in western Ukraine, the church in 2005 moved its headquarters from Lviv back to what he called its historic birthplace in Kiev. The Russian Orthodox Church in Moscow protested—and objected again in 2013, when the newly built Patriarchal Cathedral of the Resurrection of Our Lord was consecrated in Ukraine’s capital, close to the eastern bank of the mighty Dnipro River. Speaking of the other families of the Eastern churches, he spoke repeatedly about “political correctness,” and conveyed the idea that clergymen have the duty to share with others, their flock and with other people of the cloth, the truth of what is happening in their countries. Archbishop Sviatoslav certainly does that every chance he gets. 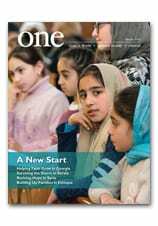 Read more about the Ukrainian Greek Catholic Church and other Churches of the East in the Autumn edition of ONE.